Another autumn is well underway which means that Black Friday (November 23rd) and Cyber Monday (November 26th) are just around the corner. 1. Define your budget – Tempting as it is to start making a wish list as you browse your favourite sites, Black Friday and Cyber Monday are about snagging bargains without damaging your bank balance. It doesn't take long to set your budget and see how much you can afford. This way you also avoid the trap of overspending. 2. Make lists – Making a list of what you need to buy and what you want to buy makes life easier when you get caught up in the excitement of Black Friday and Cyber Monday. You might not know the prices yet but having a list will keep you focused and limit the risk of impulse buys that you might regret, as well as reducing the amount of time you could have to waste navigating return policies. Split your list into two: items you definitely want or need and those you'll buy if you have any money to spare later in the day. To add a surprise element to the experience, why not add a set amount to your budget for a single impulse buy? 3. Set up store accounts and fill your carts online – It's always good to be prepared in life, especially when a huge discount code is coming in and the best items are sold out within minutes. To avoid that, sign up with potential merchants, insert your personal information and have your carts ready. If your top deal comes in, you're instantly ready to insert the voucher and press the button. 4. Keep personal profiles up to date – If you have accounts with online retailers, check if your personal profile, delivery address, and billing details are up to date. Wasting time at the checkout might mean you lose a great bargain before you can check out. And, be sure you know your username and password for all of the sites you'll be shopping from. 5. Compare prices upfront – When you know what you want and you know roughly where you can get it, compare prices. You can use the idealo price comparison widget here (scroll down a bit on the group pages), go on idealo.co.uk itself, or check out older hotukdeals offers to find tips and the best prices. 6. Stock up on gift cards – To really benefit from Black Friday bargains at your favourite online stores, consider purchasing gift cards and combine them with offers, vouchers, and price errors. Take a look at the Gift Cards-pages here to be ahead of all the deals before and during Black Friday and Cyber Monday. 7. Follow your favourite retailer for the best deals – Set aside some time to visit all of your favourite websites and sign up for their email newsletters, as well as following them on social media networks such as Facebook, Twitter and Instagram. Many retailers reward their followers with exclusive bargains, great discounts, competitions and useful shopping tips, plus you can share this information with the community on hotukdeals and earn some appreciation from the crowd. 9. Bookmark the Black Friday/Cyber Monday pages and set Keyword Alerts on hotukdeals – You're almost ready to go. 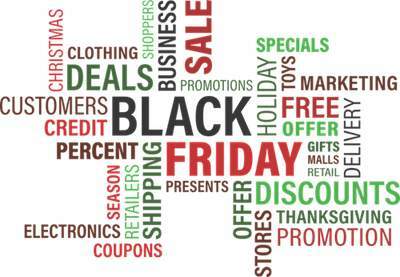 Last but not least, and in order that you don't miss any of the deals, bookmark the special Black Friday and Cyber Monday event pages at hotukdeals where all of the deals are collected and merchants have their specific shopping event pages. Plus, if you set a hotukdeals Keyword Alert for your favourite product, you'll get a notification via email or browser every time a deal pops up. To set the alert on mobile/desktop, go to "Settings" > "Keyword Alerts" > "New Keyword" > insert "PS4" or alike and a minimum temperature. In the app you'll find the function under "Inbox" > "Manage Alerts" >"Add a new keyword". 10. Use your credit card for larger purchases for maximum safety – All credit cards issued in the UK have to offer a money back guarantee if something you buy is faulty, you don't get satisfaction from the retailer, or if a business folds before you receive your goods. To benefit from this protection be sure to use your credit card rather than a debit card when making purchases between £100 and £30,000. What do you think of these hints and do you have more tips for the busiest shopping time of the year? If buying from Amazon, use a price tracker website to see whether what you are buying is actually a bargain or not. Some discounts are not what they seem. uk dot camelcamelcamel dot com is pretty good. Only buy what you need and don’t be tempted by offers on things you don’t. Have a list of items and stick to that list. Kids will understand. You can buy them something cheap and explain why. All that interest you’d be paying is robbing them of things, the only way to stop that is pay it off then they can have nice things, it also teaches them to live within their means, a lesson many young people don’t understand. How do I bookmark the black Friday page linked in number 9? Just in your browser or there's also a banner on the hotukdeals homepage. Pro tips? You mean Common Sense tips? Always good to get a professional sharing hints & tips. Lock your debit card away and don't be fooled into thinking you are getting a bargain. No 6. There isnt any gift cards apart from the Tesco offer. .
Any idea where else can I get love to shop gift vouchers and Amazon? Defo update your address/payment details at places like Curry's considering they ballsed up last year! Deals were quick. Defo update your address/payment details at places like Curry's …Defo update your address/payment details at places like Curry's considering they ballsed up last year! Deals were quick. 13. If you have >£3,000 debt, say, on your credit card, on a monthly net spend of £200 after mortgage, rent, utlities, transport, food, other essentials...then try to ignore Cyber Monday and Black Friday. 13. If you have >£3,000 debt, say, on your credit card, on a monthly net …13. If you have >£3,000 debt, say, on your credit card, on a monthly net spend of £200 after mortgage, rent, utlities, transport, food, other essentials...then try to ignore Cyber Monday and Black Friday. If you have debt don’t waste money on Christmas, pay the debt off instead. I am not sure, but giving gifts during December is a Pagan tradition, yule time. Winter solstice day is Friday , 21 December this year. I am not sure, but giving gifts during December is a Pagan tradition, yule …I am not sure, but giving gifts during December is a Pagan tradition, yule time. Winter solstice day is Friday , 21 December this year. How many pagans in the room? There’s roughly 57k in the uk. Great first contribution& welcome to the site, @TobyEy,Always good to get …Great first contribution& welcome to the site, @TobyEy,Always good to get a professional sharing hints & tips.Thanks. 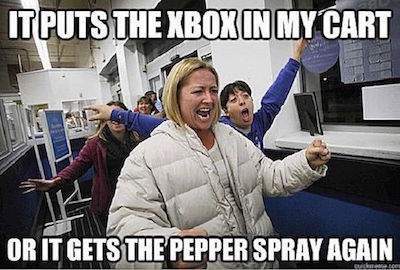 "10 Pro Tips and Tricks to Prepare for Black Friday and Cyber Monday"
Kids will understand. You can buy them something cheap and explain why.All …Kids will understand. You can buy them something cheap and explain why.All that interest you’d be paying is robbing them of things, the only way to stop that is pay it off then they can have nice things, it also teaches them to live within their means, a lesson many young people don’t understand. Yep, people go crazy and think they are helping their kids to have an amazing Christmas but it’s a downward spiral that makes them suffer more in the long run. Yep, people go crazy and think they are helping their kids to have an …Yep, people go crazy and think they are helping their kids to have an amazing Christmas but it’s a downward spiral that makes them suffer more in the long run. Unusual source, but Game website is where I got mine last Black Friday, fantastic deals for 55inchers. If buying from Amazon, use a price tracker website to see whether what you …If buying from Amazon, use a price tracker website to see whether what you are buying is actually a bargain or not. Some discounts are not what they seem.uk dot camelcamelcamel dot com is pretty good. Can you recommend any other price trackers for big vendor websites? Unusual source, but Game website is where I got mine last Black Friday, …Unusual source, but Game website is where I got mine last Black Friday, fantastic deals for 55inchers. Nice recommendation, thanks.Can you recommend any other price trackers for …Nice recommendation, thanks.Can you recommend any other price trackers for big vendor websites? Sorry MmC I cannot; Amazon trackers are the only ones I am aware of... maybe Google it? Only buy what you need and don’t be tempted by offers on things you d …Only buy what you need and don’t be tempted by offers on things you don’t.Have a list of items and stick to that list. teaches them to live within their means, a lesson many young people don’t u …teaches them to live within their means, a lesson many young people don’t understand. No point having nice things if come July they are taken by bailiffs is there? I actually lost out due to following this advice lol (granted only a few pounds). The alert system is terrible! Is there a question there?